I had to draw a Looney Tune! :) Porky Pig seemed to fit the bill for a triple scoop of ice cream! :) I haven't done too much drawing this last week because of the dreaded monthly shopping day, but I'm now catching up and it feels great to be creative again! Guess who is taking the day off COMPLETELY? ME! 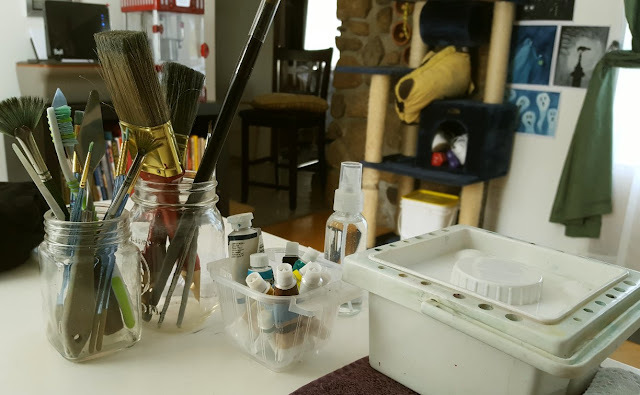 :) All I'm going to do today is draw and paint...and occasionally run outside to throw snowballs at that annoying nuthatch who wants to drill holes into the wall of the cottage. By the way, an update on yesterday's post: No husky in the trap this morning. No hot dog touched. No new yellow snow in the back yard. I'm hoping that this dog is back home safe and sound! We will keep the trap for a few more weeks just in case though! 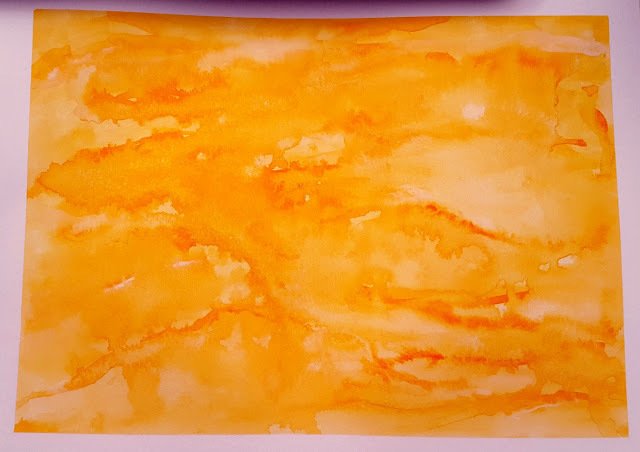 I love the watercolour "cream" creation! My favourite ice cream has always been mint chocolate chip. Your abstract art is so cool. So happy looking. Ohhhh the dinners you put on!!!!!!!!!!! Oh mercy they look so good!!! Complete day off! Wonderful!!!!!!!! Enjoy!!!! 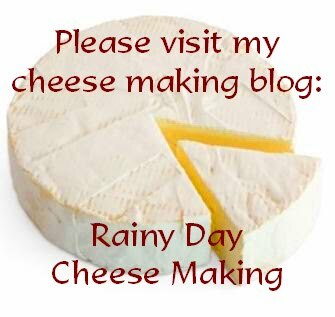 Enjoyed all your 'creamy' pieces today Rain. Sorry no husky in the trap. Your cream piece is cute. Fun that you think of your love with the dreamcicle. Nice that you are enjoying an art day. I need to stop looking at your blog! ;-) It makes me hungry!!!!! I am a creamsicle lover, too! 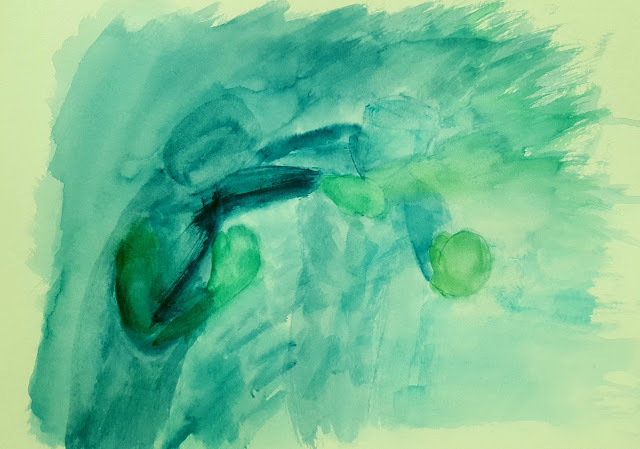 Love the colors in the latest paintings - that green cream is dreamy. Too bad that you didn't trap that bad boy, as at least you wouldn't have to worry about running into him while you're out with the pack. Hope he has gone home to his bad owner. 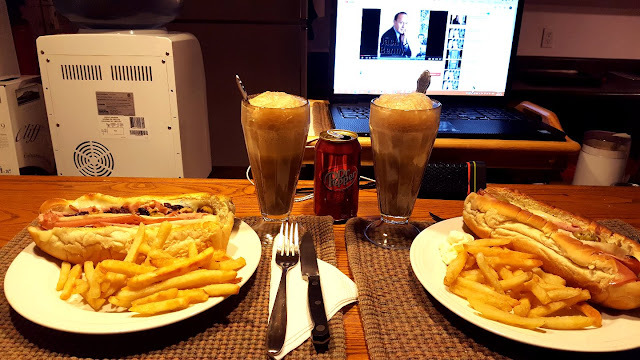 That meal is total comfort!!! Glad your shopping pilgrimage is over for the month, too. The second I saw your first "cream" picture, I saw the two battlers going at each other. Fighting (boxing . . . ugh!) turns me off, but for some reason I rather like your painting. Oh yes those creamsickles are wonderful, the first one I ever had was from the country store near our house about 55 years ago and I still remember the event. your creamy art is beautiful, I love the fluidity,, it just flooooows. Creamcicles are my fave too,, second I really like the strawberry shortcake bars,, its the only ice cream I eat, hope that husky has returned to his home, sure would make things easier for you,,a caged mean dog is never a good thing!! See now, that's a version of cream that I had not thought of. I love your blue watercolors. They really draw me in. 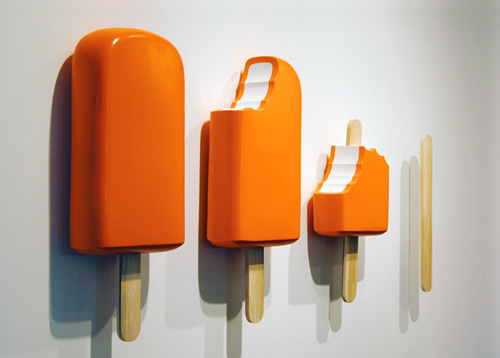 Your creamsicles remind me of the custard that we buy at the beach during the summer. Vanilla and orange cream twist. Oooh, I could go for one of those right now! Rain, I think you may be The Cream of the Crop. Love all your illustrations. I had so many ideas, I decided to go with the thumbnail sketches. 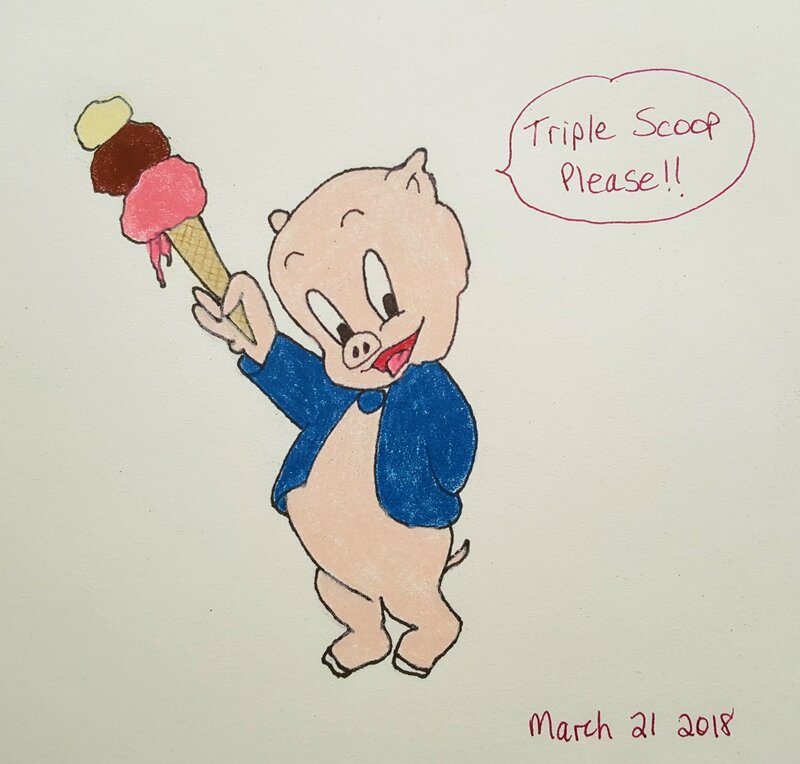 You have a nice way with watercolors, and who wouldn't love Porky Pig with his triple scoop!! You meals always look delicious. ICE CREAM.......Lets all scream....ICE CREAM!!! haha.....I love it. Moose Tracks mostly but I pretty much like anything that has chocolate in it, but since my surgery, I can't eat much, it makes me sick. Loving your meals and how you present them. i enjoyed seeing your art - porky is cute! my favorite is a seasonal ice cream, pepperment..yum. and next is any kind of salted caramel. your dinner looks good. Chocolate Chip Cookie Dough - Really, there is no other ice cream. Hiya Rain, we don’t call them fries - we call them chips over her!. Still, you Canadians are different to us Brits and I prefer the way YOU talk. I like lollies too. The trouble is that i’m such an addictive kind of guy I couldn’t stop at one. I’d eat the last one. Alex must look forward to mealtimes because they are best i’ve ever seen. Thanks Christine :) I think if the dog comes back, it'll be on a weekend, so we'll see in a few days. Hi Susan :) That meal was so good...I really enjoyed it for a change. We don't buy too many cold cuts because they have to be eaten right away, I don't like to freeze them, but this time it was all planned! I couldn't even finish mine! No husky yet! Thanks Laurie :) Strawberry shortcake anything!! Gimme!!! :) Well, so far we have nothing in the cage though one of the hot dogs is missing! We think it was likely a stray cat though. Hi Sandy :) Thanks :) Salted caramel...I don't think I've had that, I never thought about salt and sugar together in a dessert until I made some Nutella cigar cookies with salted tops, and it was quite a nice surprise! Hi Terry :) Chips! I often will call them chips too, I like it better. :) Alex loves meal times! I do too. It's our favourite time of the day lol...sorry to tempt you, I know you're sugar-free now!! I seldom eat ice cream, but youhad to show my most favorite popcycle. Orange and vanilla just seem to GO -TOgether! This watercolor would be a terrific inspiration for a yarn colorway! What a fierce, little bird to be able to drill holes into wood. I would say good, ol Rocky Road is my ultimate favorite as I have good memories of my dad making us root beer floats with it. Love your first picture...very good! And who couldn't love Porky! I love dreamsicles too and so much more in the ice cream world. I hope the dog is gone and the nut thatch goes! Good for you taking a day off! Did you already go shopping? I missed it..that and your menu making. Enjoy your day. I adore Italian sandwiches....do you make Italian beef with the juice and hot or mild peppers....yum! I'm impressed with how much motion and intensity is in the watercolor of the boys! I used to work at an ice cream parlor when I was in high school. But that was before they made my favorite flavor, which is Chocolate Chip Cookie Dough! OMG ... boxing :) Only you could connect boxing to cream. I laughed when I saw that and your painting is perfect. I used to watch boxing. It was what everyone did on a Saturday night, but we didn't have a TV so my friend and I would sneak out and watch it through a neighbor's window. Ha, I had forgotten how ornery I was as a kid ... wonder what ever happened to that quality. Do you think being old should preclude it? I don't ... :) So I have to agree that dreamsicle's are the best, but then there is Dairy Queen and Baskin Robbins and on and on. Lets face it Ice cream wins in the end. Wonderfully fun, Rain ... always love coming here. Hi Sam :) Yes! last Monday was shopping day...10 1/2 hours from start to finish...that includes the driving, shopping, unpacking and sorting after. At least it's done until mid-April now! At the end of the month I'll need some fresh produce and milk, but I can go to the store that's a 10 minute drive away for that. I would LOVE to add mild peppers to the Italian sandwiches, but they give us heartburn...sometimes we cook with them, then remove them so at least we have a little of the flavour! :) The dog has not shown up yet, but it's Friday now, if he comes back, I think it'll be on the weekend, we'll have to see! Hi Rain, today is my 70th day of being sugar-free. I’ll let you know when I get to day 100,! I don’t try and say what anyone else should eat- it’s none of my business! Please eat what you want to. Thanks for the visit. Green is a color that always draws me in. I have read so many blog posts since yesterday that I wasn't sure I read this one already. LOL How's that for confused? Your artwork is wonderful. I always like to see what you'll come up with next. Love the Porky Pig! I really enjoy drawing these characters. It's fun. 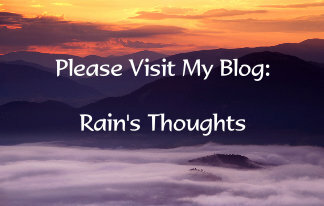 Have you ever seen any "nose art" from World War II aircraft, Rain? You could have made a fortune back then, because your Porky Pig would have made great nose art and you could have done commissions! I used to have an Amazon account where I sold my old books I didn't want anymore. It turned into a real pain in the rear going to the post office, so I quit. But while I was doing it, a "tattoo parlor" in Miami bought all three books I had on the subject! I love creamsicles too!! Your Porky Pig is so cute! I love all your paintings! The orange one is so happy! Yummy food!! Not good to look at before going to bed! LOL! Happy you took a day off! Sorry you haven't caught the dog yet! I hope he is home!!! Good luck with the nuthatch! LOL! Big Hugs! I'm not sure which interpretation I like best but they are all lovely and wonderful takes, Rain. I so love that both you and Alex like Creamsicles the best. Who would have every guessed? I do like them too though must say. So great. Love your abstract there as well adn ice CREAM is perfect too in anyway for me. :) Thank you so much. finally got around to visiting people! P.S. I can only imagine how much of an ordeal it must be to go shopping jsut once a month--its bad enough once a week! March - Out Like A Lion - Booo! Hissss!